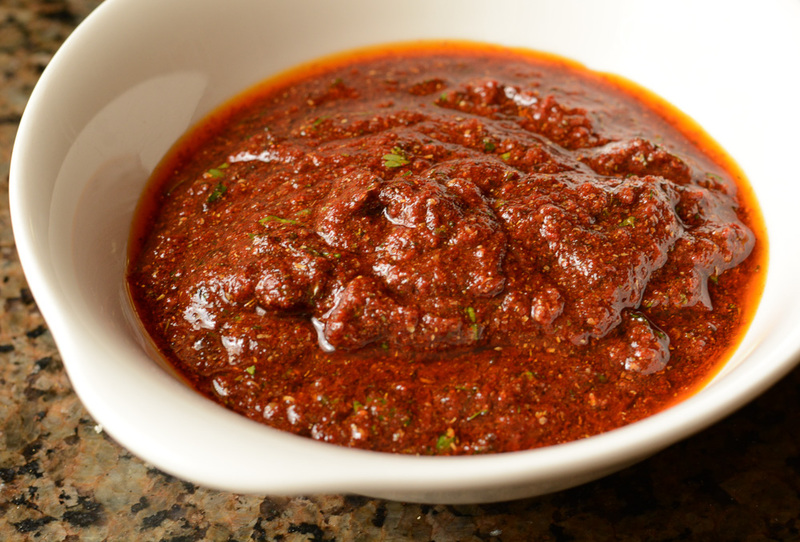 This tandoori marinade is loaded with big Indian flavours. If you can grill, you can make better tandoori chicken than you can buy. 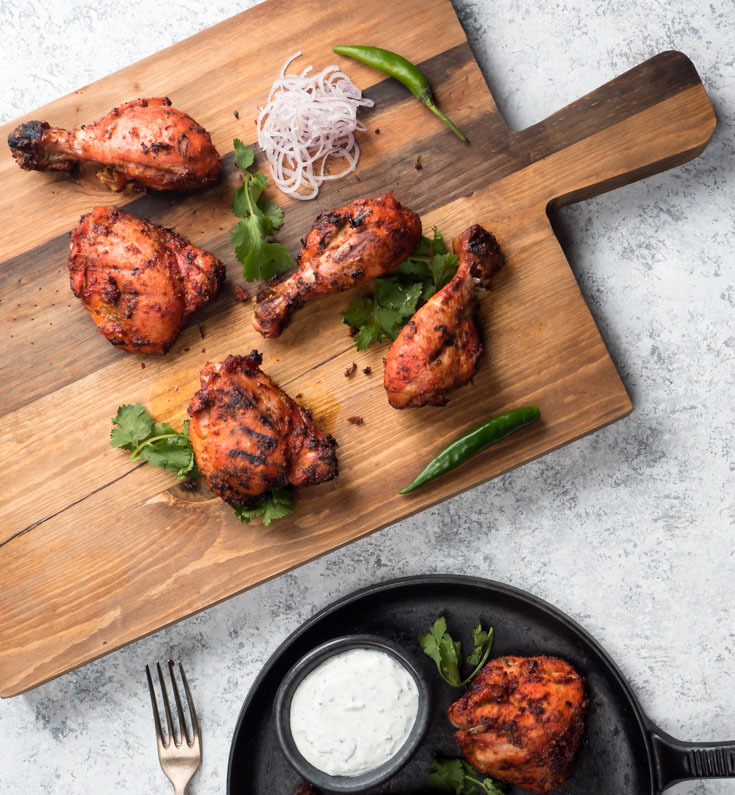 I don’t know why it is but the tandoori chicken in restaurants in North America is just not good. Maybe it’s marinated too long. Maybe it’s overcooked. For sure is nowhere as good as it could be. Which is too bad because it’s one of the great chicken dishes of all time. I use tandoori marinade all over the place. Tandoori chicken – sure. But tandoori tacos. And chicken tikka. Or rotisserie up a whole tandoor chicken. Why not? My favourite way to cook tandoori chicken is to grill over charcoal. That little hint of smoke just makes it magic for me. If I had a tandoor maybe that would be my favourite. But if you can’t get to your grill the oven works too. Roast the chicken on a rack. Hit it with a blast of the broiler at the end to crisp it up a bit. Beautiful. That works especially well for chicken tikka. Kebabs just work well in the oven for some reason. That’s what I do in the dead of winter to get my tandoori fix. I’m a bit of a heretic when it comes to tandoori marinade. I don’t like to include yoghurt. That goes against pretty much every tandoori recipe out there. But there’s a reason. Yoghurt and other acidic marinades break down the proteins in the chicken. Think of ceviche. That is fish cooked with nothing but acid. No heat at all. That pre-cooking effect turns chicken into mush. Terrible texture. Just not tasty. You can try to fix it by cooking it over crazy high temperature. That helps some as long as you don’t overcook it. That’s what a tandoor oven does. Searingly high temperatures. Or you can set yourself up for success from the start. Leave the yoghurt out of your tandoori marinade. Break with tradition. It’s not that scary. Honest. I came to this conclusion after eating at a tandoori kebab restaurant in Bangalore. Their chicken was moist, the flavours explosive. So good. I thought about it for a while then asked “Do you use yoghurt in your marinade?”. “No, we don’t”. Haven’t used yoghurt since. I add the lemon at the end. I don’t get mush and nor will you. There’s a lot of ingredients in this marinade. The recipe works really well as written. But it won’t completely fall apart if you leave one out. Even two. But each ingredient adds a little something. And the combination is what makes this recipe special. Complexity. This isn’t a one-dimensional tandoori marinade. It might seem harder than it needs to be but all you are doing is mixing some stuff up in a bowl. Nothing more involved than that. Dump some stuff in a bowl and mix. Not so hard. And it’s going to be better than you have been getting at your local Indian restaurant. Unless you live in India I guess. Then it will just be as good. 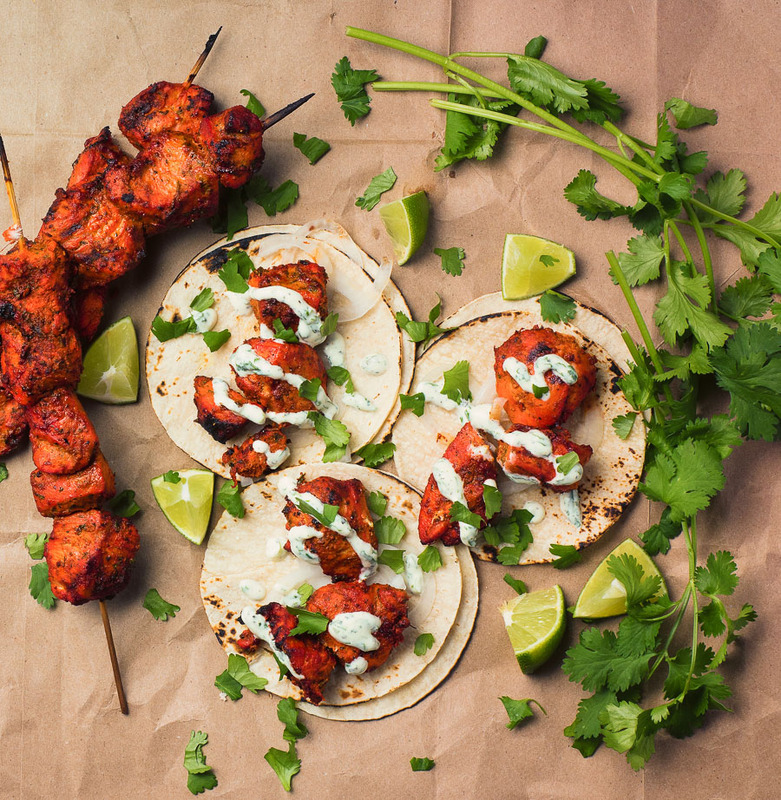 Try it to make really good chicken tikka, tandoori chicken or even tandoori tacos. Oven or grill or tandoor. 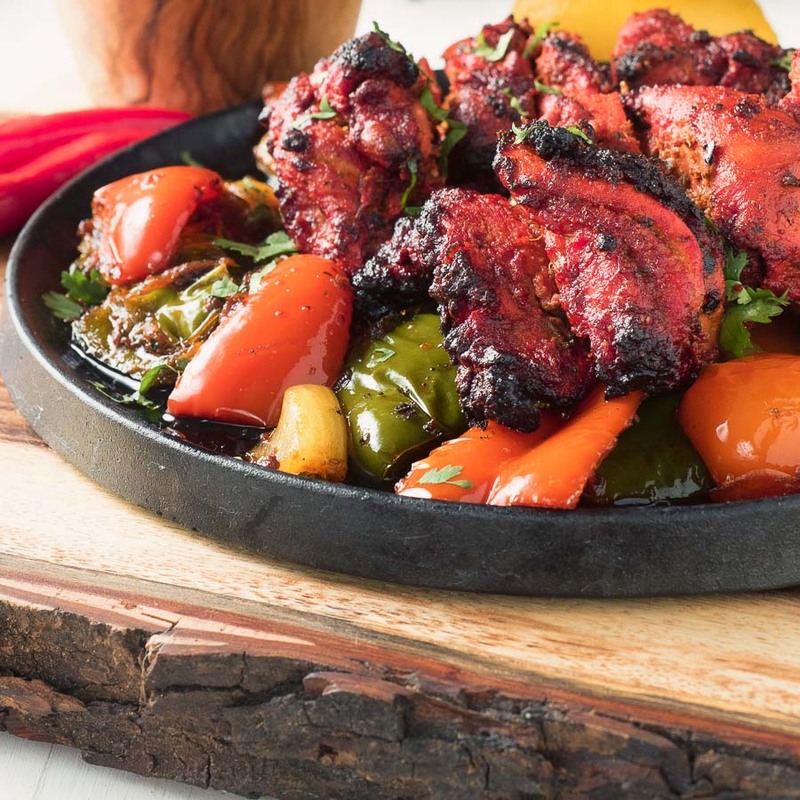 Start with a great tandoori marinade and you’ll get great tandoori chicken. Leave the yoghurt out completely and add the lemon at the end to keep the mushy texture away. Don't be put off by the long list of ingredients. You can skip one or two if you can't find them. Each one adds a little bit to the whole, though. Combine all the ingredients except the water and the lemon juice. Add water, a bit at a time until you get a consistency like the picture. Marinate meat at least an hour and up to 12. Add the lemon juice just before cooking. Find dried fenugreek leaf or kasoor methi at any Indian food store. It's a key flavour to many indian dishes so if you like to cook Indian, it's good to have on hand. I used food colouring for this marinade. Other than colour it adds nothing. It's messy as well and you have to use gloves to handle the chicken. I normally leave it out. 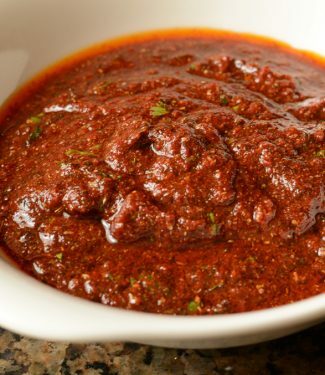 If you don't have, or can't get a mild kashmiri chili powder, substitute 1/2 tsp cayenne plus 1 1/2 tsp paprika. This marinade makes enough for one chicken plus four chicken thighs. A bit of mango powder sounds like a wonderful addition to tandoori marinade. Thanks for the idea! My husband has requested tandooori chicken for Father’s Day. This sounds like the perfect recipe! Were I to double the marinade it would keep okay in the fridge for a few weeks, correct? I think you’ll like this recipe. It will most certainly keep OK in the fridge so long as you are not trying to re-use it. What is hot curry powder and mint sauce? Hot curry powder is any one of many pre-made spice blends. Lalah’s madras curry powder is an example. Mint sauce is a sweet mint mixture that is literally called “mint sauce” in North American and European groceries. Cant find mintsauce can I use mintleaves instemde? ? I’m also confused by the mint sauce, what is it? Mint jelly like you’d serve with roast lamb? That green Mint chutney, which seems interchangeable with Coriander chutney? Please, point me in the right direction. This one confused me at first as well. It is not mint jelly and it is not mint chutney. It’s a liquid sauce with bits of mint. It’s a bit sweet. If you google images for mint sauce Colemans is one brand. Crosse and Blackwell is another. I regularly cook chicken tikka & tandoori chicken, using a different but similar marinade recipe. Most of the ingredients are the same. However, I don’t use the hot curry powder and the tandoori paste. However, I use 1 tsp of sumac. I will try your recipe with sumac and see how it goes. Quite simply superb. THANK YOU! This marinade is the best I’ve ever tasted. Thank you for sharing. Great to hear. Thank you. Every little bit adds to the final result! You are welcome. It is a long list of ingredients for sure but I think it’s worth it. This is always a winner! I often make it for parties and people can’t get enough. This recipe is indeed excellent. I’ve made it a few times now and it never fails. I often make a large batch, particularly if I am lighting the barbecue as that is the best place to cook them as the smoke adds extra flavour and it is easy to get a bit of charring which adds even more. They also freeze very well, for adding into curries at a later date or just eaten as is. I notice that some posts have queried the mint sauce. If you can’t get it ready made then it is very easy to make. And better for being fresh. It is an essential condiment in the Uk to accompany roast lamb. Chop fresh mint very finely, mix with malt vinegar ( but any vinegar will do) just enough to form a wet paste, then add just enough sugar to take the acid edge off a bit, but not too much as you need that slight acidity, which helps cut through the fattiness of the lamb. That’s it really. Keeps for years in a sealed jar. Thanks for the detailed review and fresh mint sauce recipe! Hello. Does this marinade freeze as I have made far too much. I’m sorry. I’ve never tried. I imagine it would be OK. It will keep in the fridge for a week though so if you’re thinking of making something else with it I’d try that first. Hi thank you your quick reply. I’ll make another shaslik with it in the next few days or can you recommend something else.